When choosing a style of lighting, there are some things you should look at before committing to a particular design. Modern style lighting is popular because of the energy conservation of LED lighting, the style and color coordination of the hardware, fabric, furnishings, and paint. These are all important design details to consider. Modern style is often confused with Contemporary style. These two designs are actually different. In this article we'll go over what exactly is Modern style and what to consider before choosing Modern style lighting. Modern style came from the modern art movement in the 1920's-1950's. It is different from contemporary design, because it's a defined style, it was a response to the Victorian and Gothic era where everything was ornate and used heavy textures. Modern style focuses more on clean lines, geometric shapes and simplicity. In addition, it's also a lifestyle that encourages minimalism and energy conservation. 1. Should I Choose LED? 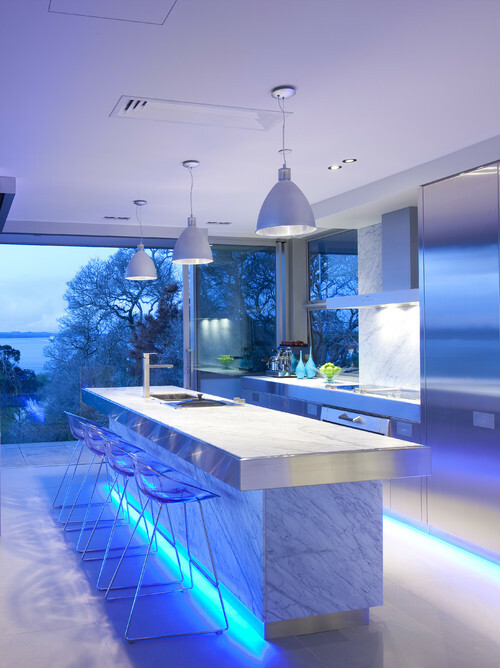 Modern Style lighting consists of lots of LED lighting. LED lighting has become the standard for energy efficient lighting using a fraction of the light of a standard low voltage, halogen or incandescent bulb. LED is a cleaner energy, it also emits less heat and is less costly. The lifespan of an LED bulb lasts years, so you will rarely ever have to change a light bulb. You should be using LED wherever possible. 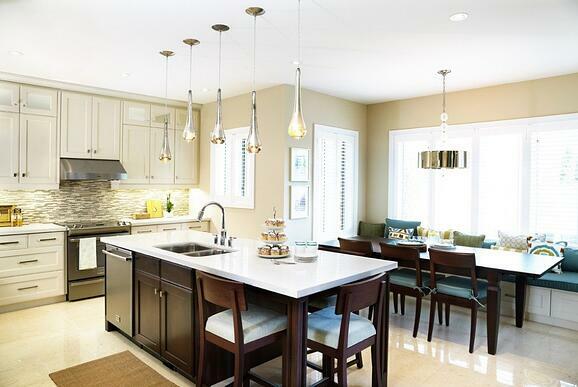 The second consideration is the size of the room and length of the counters. This determines the number of lights needed. The kitchen above has a 9 foot island. Each light circle will be around 24" diameter therefore you will need four or five pendants. A high ceiling may need narrower beams and more lumens.The height of the ceiling dictates the size of the light circles (intensity of light) to adequately cover the space. 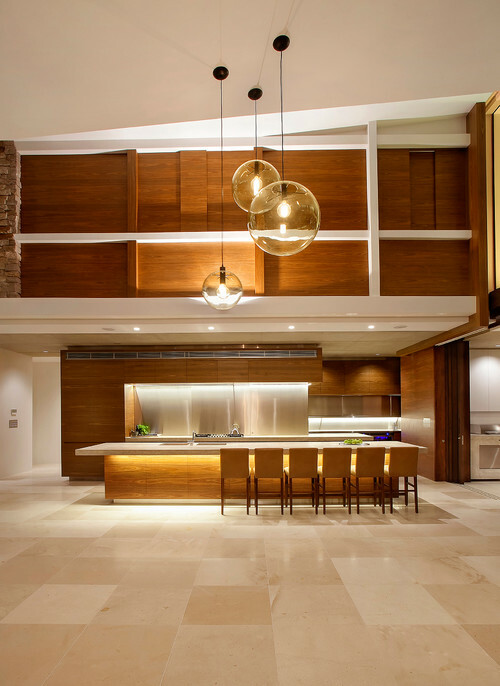 Recessed lighting is often used with Modern design because the more intense beams will punch the light down and its design is hidden and minimal. If the room is larger, use larger fixtures. You should look at wider fixtures to fill up the space with rooms that are large with high ceilings. Use the diagonal of the room in feet and convert to inches as the smallest fixture. I like to add 7" to use a larger scale. The fifth consideration is style and color coordination with other hardware and colors in the rooms. 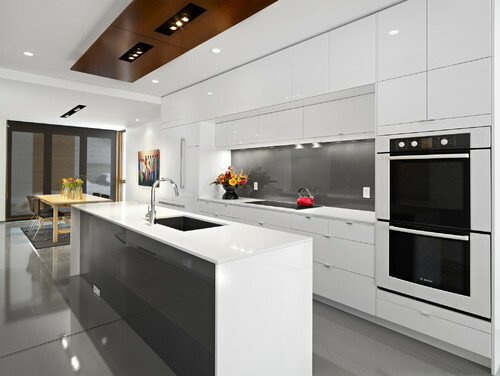 Modern style uses lots of gloss, stainless steel and even natural elements like wood but resurfaced. Modern style lighting should match those elements because it is chic yet back to the basics. Much like all lighting projects, you have to plan first. Choosing a certain style first, then planning your lighting design is important because it may dictate which light fixtures you can have or where to place them. What style, color, and fabric am I using? Want to learn how to properly light your kitchen? 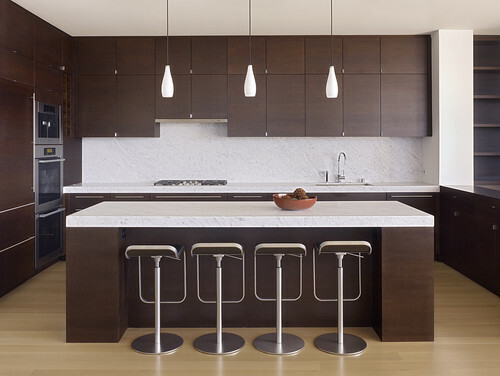 Get The Yale Kitchen Lighting Guide with the 4 elements of illumination. You will learn how to layer lighting using recessed, under cabinet and decorative lights. Over 150,000 people have read a Yale Guide. How High Do You Hang a Chandelier?